I love stir fry. It’s fresh, simple, quick, and lends itself so well to a vegetarian lifestyle. The fact that I love stir fry made the fact that I wasn’t very good at making it kind of sad. I, like many other aspiring stir fry chefs, labored under several common misconceptions about this type of cooking. For one, I suffered from “kitchen sink syndrome”, otherwise known as “let’s throw ALL of the leftover veggies, rice and noodles in the fridge into tonight’s stir fry”. And I would usually end up with a mushy, rather tasteless mess. So really, for me, the research for this episode of the Vegetarian Zen podcast could not have come too soon!! 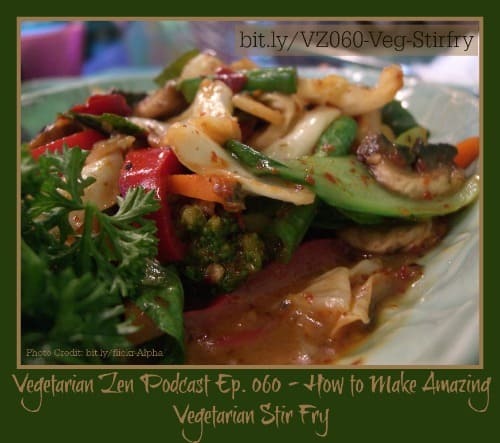 Listen in as we discuss the basics of creating wonderful stir fry dishes, from equipment to the essential elements of a good stir fry to tips to make your meal a success. Do you have tried-and-true stir fry methods of your own? We’d love to hear them!